"Like Brecht's haulers and builders, few cotton workers have entered our history books. Most left not even a trace; too often they were illiterate, and almost always their waking hours were occupied with holding body and soul together, leaving little time to write letters or diaries, as their social betters did, and thus few ways for us to piece their lives together. One of the saddest sights to this day is St. Michael's Flags in Manchester, a small park where allegedly forty thousand people, most of them cot­ton workers, lie buried in unmarked graves, one on top of the other, 'an almost industrial process of burying the dead.' Ellen Hootton was one of these rare exceptions. Unlike millions of others, she entered the histori­cal record when in June 1833 she was called before His Majesty's Factory Inquiry Commission, which was charged with investigating child labor in British textile mills. Though only ten when she appeared before the committee and frightened, she was already a seasoned worker, a two-year veteran of the cotton mill. Ellen had drawn public attention because a group of middle-class Manchester activists concerned with labor condi­tions in the factories sprouting in and around their city had sought to use her case to highlight the abuse of children. They asserted that she was a child slave, forced to work not just in metaphorical chains, but in real ones, penalized by a brutal overseer. "The commission, determined to show that the girl was a 'notorious liar' who could not be trusted, questioned Ellen, her mother, Mary, and her overseer William Swanton, as well as factory manager John Finch. Yet despite their efforts to whitewash the case, the accusations proved to be essentially true: Ellen was the only child of Mary Hootton, a single mother, who was herself a handloom weaver barely able to make a living. Until she turned seven, Ellen had received some child support from her father, also a weaver, but once that expired her mother brought her down to a nearby factory to add to the family's meager income. 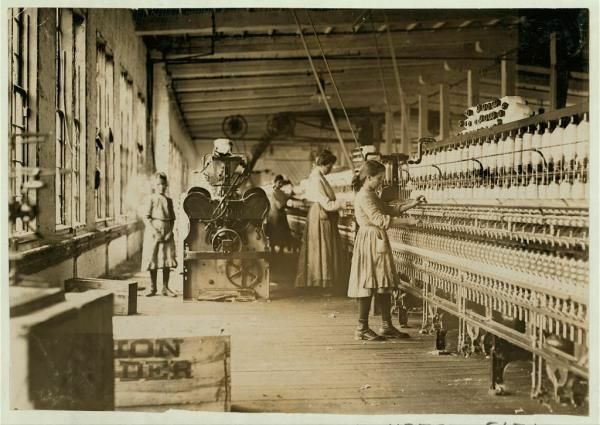 After as many as five months of unpaid labor (it was said that she had to learn the trade first), she became one of the many children working at Eccles' Spinning Mill. When asked about her workday, Ellen said it began at five-thirty in the morning and ended at eight in the evening, with two breaks, one for breakfast and one for lunch. The overseer, Mr. Swanton, explained that Ellen worked in a room with twenty-five others, three adults, the rest children. She was, in her own words, a 'piecer at throstles' -- a tedious job that entailed repairing and reknotting broken threads as they were pulled onto the bobbin of the mule. With constant breakage, often sev­eral times a minute, she only had a few seconds to finish her task. "Like Ellen Hootton, thousands and, by the 1850s, millions of workers streamed into the world's newly built factories to operate the machines that produced cotton thread and cloth. The ability to mobilize so many women, children, and men to work in factories was awe-inspiring. Many a contemporary was overwhelmed by the sight of hundreds or even thou­sands of workers walking to and from their places of toil. Every morn­ing before sunrise, thousands of workers walked down narrow paths in the Vosges to the factories in the valley, crawled out of dormitory beds just up the hill from Quarry Bank Mill, left their struggling farms above the Llobregat River, and made their way through crowded Manchester streets to one of the dozens of mills lining its putrid canals. At night they returned to sparse dormitories where they slept several to a bed, or to cold and drafty cottages, or to densely populated and poorly constructed working-class neighborhoods in Barcelona, Chemnitz, or Lowell. "The world had seen extreme poverty and labor exploitation for cen­turies, but it had never seen a sea of humanity organizing every aspect of their lives around the rhythms of machine production. For at least twelve hours a day, six days a week, women, children, and men fed machines, operated machines, repaired machines, and supervised machines."